Home Narmer Amenuti Dr Dre vs. Cheats In The US College Admission Scandal. MEMPHIS, TENNESSEE, USA—The face of of the widespread US College Admission cheating scandal is white, and it is specifically Caucasian. Although, the African American man, Dr Dre, made a terrible mistake by rubbing in this unspoken truth when he posted a picture of himself and his daughter, who obtained admission to a private college without cheating. Oh no! The white Americans were not amused. They were not about to allow a Black man to paint the US College Admission scandal with the brush it needed – whiteness. They came out with their pitchforks. And the white Americans claim that Dr Dre himself donated money to the college to which his daughter gained admission. As if to imply that this was somehow equivalent to bribery. However, since when was donating money to a college a crime? Are lobbyists, by implication, also criminals? Is the Israeli lobby a criminal organization in Washington? Are donations to political campaigns criminal? What is interesting is that white Americans, especially white media (CNN, The Chronicle of Higher Ed., NYTimes, etc.) are safely conniving while attempting to equate the US College Admission Scandal (which are crimes under law) with such legal acts as college donations. The way they do it is in subtle ways – talk more broadly about college donations in the same breathe as you write specifically about the crime of bribery in college admissions. The US white media understands that this method of benign obfuscation helps to ameliorate the prevailing reality in white America that the scandal of cheating/bribery in US College Admissions are real crimes. The thing is, I hope that the only people who still fall for these tricks of logic are the white people in America. I hope that this patently white American culture of cheating (right from the nation’s inception) in college admissions are not somehow glossed over as acts of necessity; of self-defense; of stand-your-ground; of parents who just want the best for their children. No. These are actual crimes. Cheating is bad. I can’t stress its unlawfulness enough. Dr Dre and his daughter attempted to burst the bubble of whiteness; of the Protestant Ethic, of the supposed Hardwork and of “Meritocracy,” that the European miracle has preached, and preached for far too long, especially when we know that it is patently Pecksniffian, hypocritical and insincere. 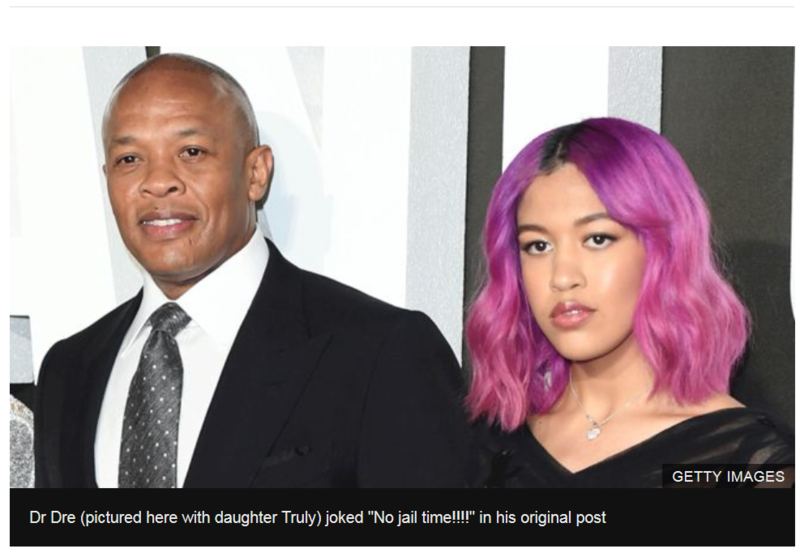 And so Dr Dre was forced (socially lynched) to remove a picture from the web (against his will) of himself and his daughter who obtained admission to USC without cheating; without paying any athletic coach to make fake profiles of her daughter; without posing for fake photoshop-ed sports pictures; without making fake videos about things/instruments she never actually played, or can play; without depositing money in the offshore banks accounts of SAT test imposters; without depositing hundred of thousands of dollars in the offshore accounts of coaches and their admission officers; etc, etc, etc. All of which the white cheating parents did. In all this, the attempt to paint Dr Dre as some long-lasting devil for donating to a college, and the actual criminals, the cheats (the white parents and their children) rather as some fallen angels (who were just trying to do the best for their children), is fascinating. The US is a fine place to study race relations. Race relations play out vividly on this stage of the European myth-making of the enlightenment. Indeed, the US is a fine place to study white people’s deeper egos. The idea of the United States of America is quite as terrifying as it has been historically petrifying. Nothing can beat it. 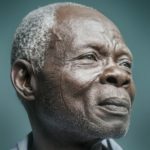 Previous articleAre Ghana’s Leaders Witches or Are They Actual Devils? Next articleCaution! Never Allow Your DNA To Be Sequenced.